CK and I are really enjoying our weekly Boston Organics deliveries. We even purchased a cooler to leave in the lobby for the nice delivery man to transfer our yummy fruits and veggies into for safe keeping until one of us wanders home from work. I had to revive my lettuce a few too many times before I realized…oh duh…maybe this stuff needs a better home than a green plastic tote for eight hours. So all in all it’s going very well. Except for the avocados. Over the last five weeks I’ve thrown out five avocados. How horrible is that! I feel guilty every time I have to toss the poor guys into the trash, but I just haven’t been able to think of a anything to do with them other than possibly make guacamole. The thing is…I sort of hate guacamole and until Sunday morning I sort of disliked avocados. I’d eat it if you put it in front of me, or you wrapped it up in sushi, but I’d never go out of my way to buy or use them. But then CK shared a post on Google Reader about making Avocado Toast, and our friend Anna chimed in with a resounding email response of, “This is totes my favorite snack!!! !” It appeared imminent that avocado and I would be forced to meet once again, and meet we did — spread on warm toast with a simple concoction of spices. It was a phenomenally good time! From now on I promise that CK and I will be fighting over the avocados in our house and I vow to never throw one out ever again. 3 slices of bread (Note: I used Arnold Country White. When I’m “bad” I’m very very bad). Toast the bread. Slice the avocado in half, remove the flesh and place into a small bowl. Mash the avocado with a fork and spread onto the toasted bread. Sprinkle the toast with Red Pepper Flakes, salt and pepper, and drizzle lightly with olive oil. I literally gasped when I read you threw out avocados! They are like $2 each here and we are very reverent of the avocado. I like them on saltines, sort of a variation of the avocado toast. Also: on tuna or chicken salad sandwiches. Second Rachel’s gasp. Avocado, sweet onion and grapefruit salad always makes me happy. Sounds good. Brings back memories of avocado and jelly sandwiches my dad made for me as a kid. It seems so different from any other way I would eat avocado, but I guess maybe in Asia avocado is more often used with sweet things. We would always use guava jelly. Not sure if I’d try it with the more common stuff like strawberry or grape. Next time, just face west, get a running start and throw them as far as you can towards the Connecticut River. Mmmm.. simple, but so delicious! I’ve got to try this. Avocados are awesome. Now that I live in the Southwest it’s like mandatory that I have them–whether in guacamole or in southwestern salads–at least once a week. I would probably eat them more often but they are $$$. There’s a restaurant here that stuffs them with cheese and fries them. aye chihuahua! I used to dislike avocados too, but all those years living in southern California among so many awesome Mexican restaurants changed me. I tried this toast recipe the other day when it came through CK’s shared items and it is GOOD! What!! It’s a crime to throw out an avocado…did you know that they are packed full of vitamins and good fat. There’s lots of recipes…such as avocado icecream, in various salads. Anyhow I’ll have to do a posting on what else you can do with avocado other than eating it as guacamole. Don’t throw out this little collection of goodness out – such a waste when they’re so expensive. yes yes yes! girl, what a great snack idea, especially when i’m trying to lose a few inches… though spoiling is such an issue. i had to throw out 6 once also and the worse part is that it was on a night i was catering a party! sigh. OMG. you must nit be from california! 😉 i live on them during the summer. the toast you have above – love that. straight up with olive oi, salt and pepper. a little bit of lemon juice. really the sky IS the limit! I can’t believe you through out avocados! I went to buy a few yesterday (in NY) and they were 3 dollars EACH! I’m glad that you ended up just spreading avocado on toast. It’s one of my favorite ways to eat an avocado. I sometimes just spread them on a thinly sliced pieces of baguette, as if it were butter (because it practically is…) Mmmm. Good. Anyway, enjoy your avocados! cookinpanda — I was thinking that! They are so monstrously expensive here. I stick them in salads though – just chopped up plain. A little healthy fat! Yum. Shockingly, though, I’ve never tried them plain with toast — I definitely will. Mmmm, love avocados, so buttery and good. Try a BLT with slices of avocado. We also serve sliced up avocado and just drizzle it with EVOO, a little bit of hot sauce and salt and pepper. Delish and easy. My mom recently discovered avocado smeared on toast in lieu of butter, and she loves it. 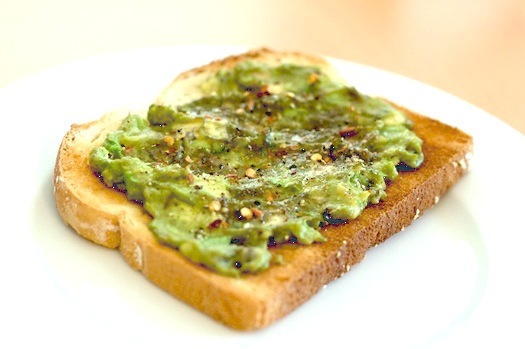 I love avocado in any form, but found it a little bland smeared on toast solo…this is the answer, I think! Doctoring it up a bit with red pepper, olive oil, s&p sounds perfect. Try a sprinkle of lemon juice over the top. Lemon and avocado are a match made in heaven!